Our first breakfast on the reef was followed by our first heavy work of the mission: a set of two 'spacewalks' that took up most of our day. First out of the 'airlock' were Nick and Satoshi, who spent about three hours running an obstacle course of lunar activities on the sea floor: running, walking, picking up rocks, climbing. For each run around the course we wore a large metal backpack that allowed support divers to adjust our centers of gravity to mimic one of several proposed spacesuit designs. 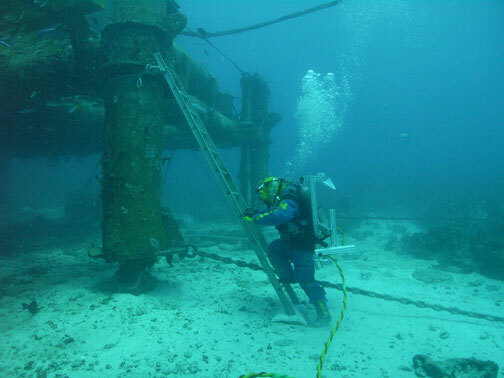 In the afternoon, Ricky and Chris performed a similar space walk, wearing a diver's weight suit, which allowed their weights to be adjusted to change their traction and locomotion. As each pair went outside, the remaining pair played the role of 'mission control' from inside the habitat - a role which Houston will not be able to play easily when we're on Mars - the communications time delay will be too long for two-way radio from Earth. Today was a day of firsts for us as a crew, and none was more significant than the end of our first night sleeping on the reef. The confined quarters of Aquarius (no more than two people can stand in the bunk room at once!) 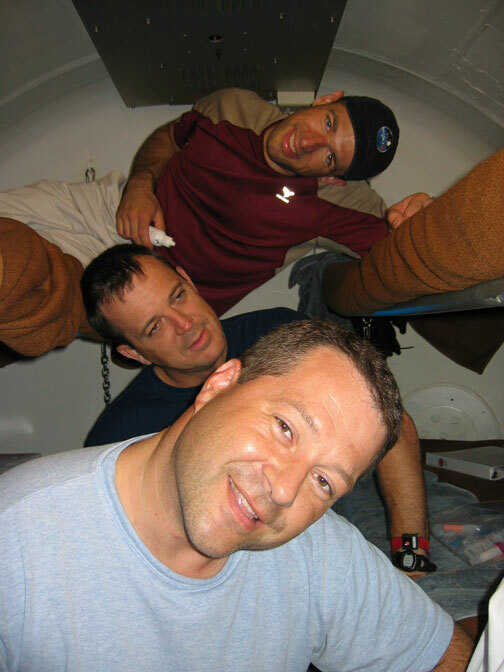 are an excellent preparation for life aboard any spacecraft - past, present or future. And at 10:19 a.m. Eastern time, Ricky, Satoshi and Chris officially became aquanauts, having spent a full 24 hours underwater! Nick hopes he has retained his aquanaut status from 2003. Good night from Aquarius and the NEEMO 13 crew!